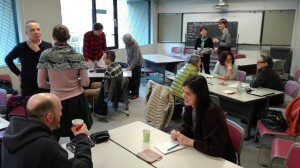 Fourteen people took part in our first get-together of 2016 held on Sunday February 21 at Otsuma Women’s University: Agnes Patko, Andy Barfield, Blair Barr, Hiromi Tsuda, Hugh Nicoll, Huw Davies, Julie Torgeson, Ken Ikeda, Lee Arnold, Martin Cater, Mayumi Abe, Nicole Gallagher, Tim Ashwell, and Tyler Kinkade, with apologies from Alison Stewart, Debjani Ray, Fumiko Murase, and Jenny Morgan. We were very happy to welcome Julie, Martin, Nicole and Tyler to their first get-together, and to have Hugh come from Miyazaki and take part too. At the end of the afternoon we wished a fond farewell to Agnes, who is moving to Kyoto to start a new stage in her career, and a warm welcome to Blair as co-coordinator for the Tokyo get-togethers in 2016. Vigyázz magadra, Agnes! Üdvözlet, Blair! For more details about the April get-together please go here. If you have any questions or would like to contact us, please email us at <ldsigtokyogettogethers@gmail.com>. We hope that many more Learner Development SIG members will join us for the next get-together on Sunday April 24. Martin (group members – Huw, Lee, Blair, Martin): When talking about our research interests and classroom experiences, a recurring theme was a shared belief that learners are capable of achieving more than they themselves – and often us as teachers – are aware of. Huw’s question ‘How does the teaching setting encourage/discourage learner development?’ led to members of the group discussing how changing classroom interaction patterns and allowing time for 1-1 feedback with the teacher in various contexts had offered insights on learner potential, presenting us with further questions on how to understand this potential and assist learners in harnessing it. We felt that challenging expectations was a positive step forward; Lee’s interest in using various media was particularly relevant in this regard, especially his experimentation conducting writing activities to instrumental music, which arguably has some affinity with fringe methodology (de)suggestopedia. In addition to this, there were other areas of shared interest within the group: world Englishes and native-speakerism; implementing extensive reading programmes and developing vocabulary level tests for such programmes; publishing learner output online; and helping learners to discover an authentic L2 voice. On a personal note, it was great to be able to attend an LD get-together for the first time. 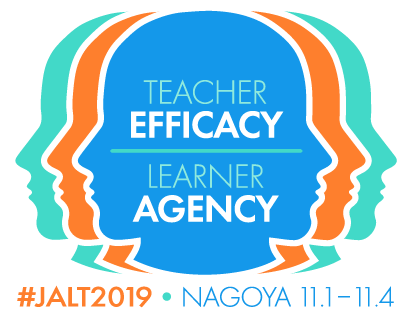 Despite attending several JALT conferences, I hadn’t actively participated in a SIG before, and really enjoyed the warm welcome from the other teachers. The session was useful not only to find out about the kinds of areas that teachers want to explore, but also to be able to hear about activities and techniques which can be applied in my own teaching contexts. 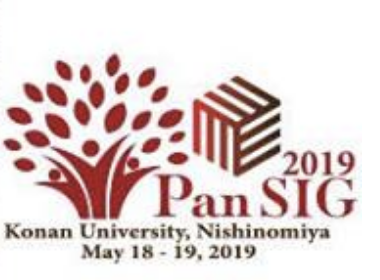 Having been fortunate enough to participate in annual Japan-based seminars on my MA programme, I recognise the potential benefits of being able to work with a community of teachers for support and encouragement on this next phase of my teaching journey, particularly with those who share an interest in learner development. For me, the most rewarding aspect of learner development is not merely when we are able to help our learners improve their linguistic competence, but rather enable them to express themselves more fully as human beings. Being able to help people transform their perceptions of themselves through language in a positive way is a real privilege, and it is my hope that participation in this group will allow me to gain a greater understanding of how I can better help to facilitate this. Andy (group members – Hugh, Huw, Mayumi, Tim; Julie, Tim, Tyler): At the start of the afternoon I enjoyed discussions with Hugh, Huw, Mayumi and Tim. * Hugh shared with me some of his ideas for making more inclusive and multivocalic the monthly Talking Points blog that he and Nicole are writing together this year for the Learner Development SIG. * Mayumi talked about the possibility of LD developing some kind of collaboration with the Framework and Language Portfolio SIG. The FLP SIG has a strong focus on the Common European Framework of Reference for Languages (CEFR) and European Language Portfolio (ELP) – see https://sites.google.com/site/flpsig/home/FLPSIG. It’s possible that a JALT chapter may want to support an afternoon event with the two SIGs in 2016. If the event had a broader focus than just CEFR such as ‘Developing self-assessment/Exploring Issues to do with self-assessment’, I thought it might appeal to many LD members (✓ yes we can?). * Part of the discussion I had with Huw, and later with Tim too, was about different critical moments in the development of our Research Histories (RHs). Huw mentioned that his RH was very similar to Blair’s. Like Blair, Huw had started doing research when he did his MA but hadn’t felt that confident about it. Taking part in the get-togethers and talking with other LDers had helped him to find a greater sense of confidence and self-direction for doing classroom research. Huw mentioned that he was about to start working at a university where group-based research projects and presentations were strongly encouraged and supported, and he was hoping to lead a workshop later this year with two of his new colleagues. We surmised that having institutional support/a supportive environment within which to discuss and collaborate with other teachers in the same workplace, study group or SIG was a key moment in both our RHs. This helped us, we felt, to explore different puzzles and issues and develop our knowledge and understanding jointly with others. Tim joined us, and we continued by talking about how seeing research as part of your ongoing teaching was central to making practitioner research sustainable. It becomes simply something that you do as a teacher: you try out things, you get student feedback, you reflect, you develop, you question as you go, you talk with others, and you involve your learners in different ways in those ongoing explorations. This led us into discussing the different stances that we can take as teacher, teacher-learner, and teacher-researcher, and how those stances are not fixed but change and are negotiated through engagement with others and with ourselves, often in response to critical incidents, a sense of failure or frustration. In the second part of the afternoon, I was in a group with Julie, Tim and Tyler. We shared with each other particular learner development puzzles that we are currently interested in. For the coming new school year Tim is interested in exploring different ways to get his seminar students to be clearer in the commitments they need to make for completing a thesis in English in their final year. He also wants to inquire into these issues in a kind of ‘dogme’ way if possible, and see how ‘exploratory talk’ of student research develops. Julie is looking at how to organise an autonomous learning course where the students are expected to develop their own study plans. She is concerned too with helping students develop their critical self-awareness and metacognition. Tyler is considering how to develop a study of students’ critical analysis of media texts in an English media class that he will be teaching in 2016. He hopes to develop the research with another teacher teaching a similar course at a different university. I would like to continue exploring how students see their writing development in different genres about the research that they do (from personalized writing, blog posts, question sheets, visual reports, to media texts such as news articles and editorials, and research reports, for example). I’d like to understand better in the coming year how students interpret the effects of this kind of ‘genre-hopping’, so to speak, and how they articulate the development of such literacy in relation to their other studies and life-goals and interests. During the early meet & greet parts of this past Sunday’s meeting I talked broadly with Andy about the Talking Points blog, and shared some of the issues and questions that Nicole and I addressed in our morning meeting as we get into our editor roles for the year. We are looking forward to exploring the discourses of learner autonomy, exploratory practice (EP), and teacher research. Then, with Julie, Ken, and Nicole, enjoyed sharing stories focused mostly on critical thinking as an issue (or ‘puzzle’) in discussion classes in university settings. Agnes mentioned the problems learners have paraphrasing, setting the stage for our later discussions of literacy and academic writing. In the second half of the day we talked about critical thinking and literacy puzzles in our teaching contexts, then shared possible research projects. Hiromi said she would like to research two linked questions: (a) How to develop critical thinking skills through collaborative learning; and (b) How to evaluate collaborative learning practices, particularly the relationship between group activity and individual results. Nicole is adjusting to a new teaching context and wondering (a) How students can engage more critically with the ideas presented in the discussion classes she’s currently teaching, and (b) is also interested in researching learner beliefs about language development in the English discussion class. Agnes is about to move to a new position in Kansai, and wondering how to include critical thinking in academic writing and discussion classes. She has also been puzzled about how to help students who have returned from study abroad programs to improve the accuracy of their speaking and writing skills. Ken is going to have a rather large number of seminar students this year and is wondering how he might research reader/writer responsibility in helping his students develop their research and writing skills for graduation thesis writing. He’s also puzzling out how to research the development of Japanese L2 identities. In Ken’s “messy beginning stages” of trying to work out what might be involved he brainstormed a list of key words – forms, manifestations, facets imagined, L2 motivation system – which might fall under the category of “conceptions” of Japanese L2 selves. Finally, I am going consider how to take an EP approach to raising lexico-grammatical awareness for academic writing, and how to encourage more engaged approaches to speaking practice among engineering students. We closed the afternoon sessions happily, but with lots of puzzles to explore in the coming months.